Writing need not lead to loneliness, and a text need not be a book to be great literature. That is the legacy of author Wolfgang Herrndorf, who took his life in 2013 following a long illness. Through “Tschick” Herrndorf wrote his way back to his youth. | © Rowohlt It’s not easy to think of a large number of German-speaking writers today who sell millions of books and write a blog. None, in fact. Daniel Kehlmann? Doesn’t have a blog. Frank Schätzing? He doesn’t either, nor does Charlotte Roche. The big exception was the Berlin author Wolfgang Herrndorf, who was born in 1965 and took his life in August 2013 following a long illness. Herrndorf became involved with the Internet at an early stage, not as an experiment but as a way of life. He got to know about writing on the Internet, and from the other people who also wrote on the Internet. Herrndorf hated modern painting and admired Thomas Mann. He loved German Romanticism and his MacBook. And he left behind a book that in the future is destined to stand alongside Bonjour Tristesse by Françoise Sagan and Catcher in the Rye by Salinger. A book that will be read by generations trying to understand what it is like to become adult. That book is called Tschick. The love story that developed between Wolfgang Herrndorf and the readers who got to know him through Tschick was short and intense, and the despair at Herrndorf’s death was correspondingly great. Fortunately, the books remain as consolation; more than one million copies of Tschick have meantime been sold. Herrndorf, who qualified as a painter and illustrator, experienced his breakthrough at a point when it was almost too late for him. When Tschick appeared in autumn 2010, he had been incurably ill for months with a brain tumour. What Herrndorf did then was to report live that he was determined to wrest sufficient time from the ticking clock to complete as many books as possible. He did this in a blog he started for his friends and later activated for everyone. He called that blog Arbeit und Struktur (Work and Structure). It was what he needed so stay in his lane. Arbeit und Struktur was read above all as a diary about dying, understandably, given that Herrndorf used his blog to document his rebellion against the tumour, chemotherapy, operations, doctors, his minor victories and major relapses, his impatience with things that took up his time, time he no longer had: silly books, bad films, faith healers. He also documented his exit strategy, not wishing to let cancer have the last word: “I need a weapon,” he wrote in March 2010. Three and a half years later he shot himself at the Hohenzollernkanal in Berlin. And three months after that his blog Arbeit und Struktur appeared in book form, which made it harder not to read the end between the lines of every entry, now that it was a hard fact. But to read it that way is to overlook the fact that Arbeit und Struktur is an idealistic document, a plea against a casual treatment of art, of language, above all, an appeal to us to read as if it were to save our life. Basically, the entries he made in just about four years, from January 2010 to August 2013, contain the whole Herrndorf, as we know him from his books: his debut In Plüschgewittern, 2002, about the journey through Germany of a young man in search of his footing; from the stories Diesseits des Van-Allen-Gürtels, 2007, one of which was awarded the Bachmann Audience Prize in Klagenfurt in 2004; from Tschick, and from the spy novel Sand, which received the Prize of the Leipzig Book Fair in 2012. Here an author with no time for sentimentality and pomp reveals himself, even at a point in time when he still seemed to have enough of it. In his blog, Herrndorf gave the name “Project Regression: how I would like to have lived” to what was later to become his novel Tschick. It is the story of Maik and Tschick, who aim to travel to the Wallachia in a stolen Lada, don’t get very far, but learn a lot of useful things for life. And just as Herrndorf, as it were, wrote his way back into his youth, although there is no way back there, so too his many readers were also able to go down that road again, by reading. This kind of shared experience is very rare in literature, as is the close bond between author and reader. Tschick is a book about friendship that would not have been possible without the friends Herrndorf himself found on the Internet and who stood by him to the end, continually accompanying his work. 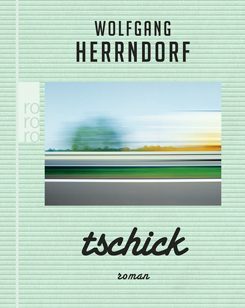 They jointly agreed on the title Tschick for the novel, and when Herrndorf found writing his blog increasingly difficult, his friends also helped him with it. Herrndorf was part of a circle who, around 2001, got together on the website Wir höflichen Paparazzi (We Polite Paparazzi). Not all of them were artists, but many of them became artists thanks to that forum – by writing to one another about what they like to read and watch, what they loved and hated, and what they found amusing. The loner Wolfgang Herrndorf emphasised again and again in his blog how helpful the social space was that he found on the Internet. That neither writing nor reading need make one lonely, that the Internet instead of isolating people opens up a whole new world, that a text need not be a book to be great literature – that is the legacy of Wolfgang Herrndorf. Tobias Rüther is an editor for the culture section of the Frankfurter Allgemeine Zeitung.